The Osprey Navy Issue is in a bad spot in game at the moment. I previously rated it at trash tier here. My friend Suitonia posted a more thorough analysis on his blog, and we’ve spent some time talking about the ship and what it needs at the moment. In short, it is a ship that has little going for it now, but has much potential in the future. The Navy Osprey is a missed opportunity and a ship that doesn’t really have a role at the moment because the Caldari line already has an attack faction cruiser. If CCP chooses to go with missiles, it first needs to have the kinetic lock removed and then decide what you want the ship to do. 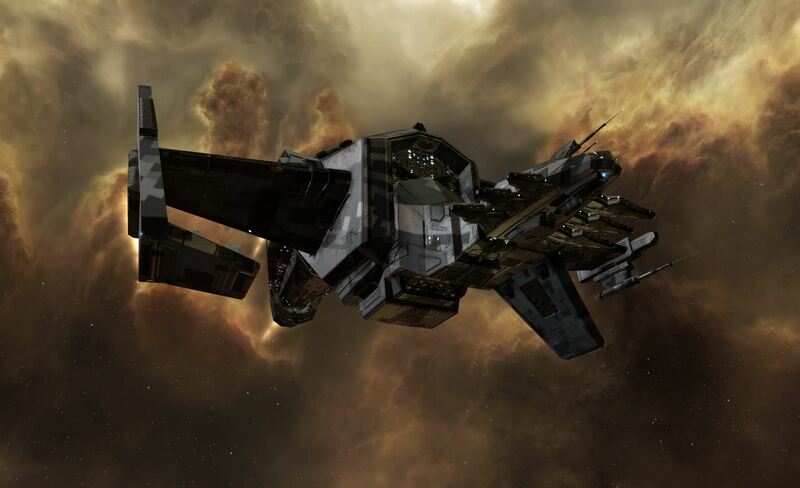 Ships in EVE should fill a role and be distinct from each other so that no two ships in the same line do the same thing. This is the case with the Navy Osprey and the Navy Caracal. Both perform the same role but the Navy Caracal does it better, and is therefore used more. The kinetic damage lock has to go for obvious reasons. I know some people at CCP like it because it “provides tactical options”, but I honestly can not see what tactical value there is in being forced to shoot kinetic missiles. One way to go here is to make the Navy Osprey specialize in short range missiles and the Navy Caracal in long range missiles. This would make both ships less flexible though, so why not start from square one? The ship could be so much better if it was redesigned into a blaster platform inspired by the Navy Augoror, with few high bonused guns and a lot of tank. A interesting thing right now is that there are no pure medium hybrid ships in the game that have a utility high slot. So the Navy Osprey based on this redesign would have a very cool thing going for it. I think the Moa is one of the most entertaining ships to run in small brawling fleets at the moment because it looks weak and gets fights. It is also a cheap and good start to learn how to do small gang brawling fleets. All you need for a good fleet is two Ospreys and five Moas and you can go out and fight much bigger gangs and have fun. Redesigning the Navy Osprey like this would provide a stepping stone for people aiming to upgrade their Moa into an Eagle or Tengu. Giving the ship a utility high would allow for a more solo options as well. Medium or even small energy neuts would help counter small fast frigates, or a Nosferatu could help maintain cap while under neutraliser pressure. It could even help people looking into PvE by allowing a probe launcher in the utility high. So what slot layout should it have? 25% bonus to medium hybrid damage per level. 4% to shield resistance per level OR 10% shield hp per level. I think this is a great starting point for the ship. There are some things to point out with the slot layout however. The fifth low slot could just as easily be another utility high slot, but dual neut fits would be too strong so I decided to give the Navy Osprey another low slot in order to keep the number of slots available for faction cruisers consistent. For the shield bonus I think that resistance or pure % shield increase per level could work. For fittings I think that the ship should be able to fit the following fits pretty easily: Neutron Blasters, MWD, LSE x2, Scram, Web, Small Cap Booster, 3x Magnetic Field Stabilizer, Damage Control, two tank rigs and one Ancillary rig. Or: Ion Blasters, Medium Nosferatu/neut, MWD, LSE x2, Scram, Web, Small Cap Booster, 3x Magnetic Field Stabilizer, Damage Control. 2 tank rigs and 1 Ancillary rig Basically, I want the ship to have a high amount of CPU but be somewhat limited by powergrid. To be honest, I trust in CCP:s balancing probably more than most, and I believe they have a chance here to create something really fun that fills a role that is not currently in the game. So in short, I want to redesign the Navy Osprey from being one of the worst ships without a clear defined role into something that isn’t the Navy Caracals retarded brother. I think it’s bad that the Navy Osprey is basically the same as the Navy Caracal except worse in every way. Both are shield tanked missile ships. Looking at the other ships, you have Augoror Navy Issue and Omen Navy Issue for the Amarr; both are laser ships but one is fast and has projection, while the other has utility and an insane tank. For the Gallente you have Vexor Navy Issue and Exequror Navy Issue. These ships are even further apart from each other: One is a strong drone platform and the other a high DPS blaster platform. Lastly, for the Minmatar you have Scythe Fleet Issue and Stabber Fleet Issue, with the Scythe Fleet Issue being a super flexible ship when it comes to fitting and the Stabber Fleet Issue being a brawling autocannon platform. But for Caldari it is shields and missiles for both ships. There is also a sense of progression for the other factions. For the Gallente you have Vexor -> Vexor Navy Issue -> Ishtar/Dominix and Thorax -> Exequror Navy Issue -> Deimos. For the Caldari there is Caracal -> Caracal Navy -> Cerberus/Orthrus. But for the Moa it’s simply: Moa -> Eagle/Tengu. There is basically no cheap middle stage and this is where the Navy Osprey would fit in perfectly.